In October, I shared ways to use Google Slides to support UDL and critical thinking. Since then, Google Slides has become an essential instructional tool in my class sessions for disseminating content and facilitating student collaboration in physical and digital classrooms. Images, youtube videos, links to webpages, Google Docs, Google Forms, Google Sheets, and other Google Slides are easily added to a Google slide enhancing course content with multimedia experiences. In searching the web, I stumbled upon a slide presentation “Cheat Sheet” with tutorials on adding multimedia content. To view this resource. When using Google Slides in class, I find it most effective if students have access to the presentation and view it from their own device. 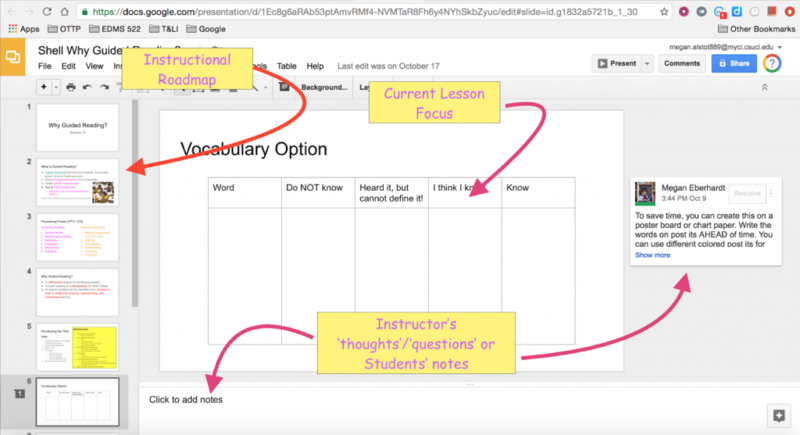 This creates a visual dashboard for your lesson allowing students to view the current focus of the lesson, an outline of the lesson progression, and instructor’s notations/comments. The commenting feature allows the instructor to embed additional information, comments, or highlight a thought or nuance that deepens student understanding.The bottom bar intended for the presenter to ‘click to add notes’, is ideal for adding self-check questions for students to consider, provide directions for a group discussion about the slide, or leave blank for students to write their own notes. For example, I work with students in the Teacher Credentialing Program. I am teaching content, but at the same time I am teaching them about teaching. I like to use the commenting feature to explain how content in a particular slide might look in a first grade classroom, or which ‘step’ in the instructional sequence of a lesson plan, this slide represents. I am able to teach ‘craft’ while delivering content. The image below illustrates this Instructional Roadmap. If you intend for students to take notes on a slide presentation, be sure they first MAKE A COPY of the presentation and save it in their own drive. Then students can add their own comments and make notes without altering the original document. When a Google Slide presentation is shared with the entire class, any content added by a student is viewable by all other members of the class. As you progress through your slide presentation, you can include slides in which you ask students to make contributions. From the instructional perspective, you must consider how many students you want to comment on each slide, how many slides you will need, and how students will form groups, but you can communicate these directions to all students easily on a slide within the presentation. For a tutorial on customizing sharing settings in any Google Application (docs, slides, and sheets). In a lesson on creating rubrics, I provided the initial ‘modeling’ in the first few slides of a presentation. Then, I added additional slides with directions to guide students through the process in collaborative groups. As students worked in groups, I was able to circulate and confer with groups and individuals, providing differentiated instruction. To view this lesson. After a Face to Face lesson on Guided Reading, I wanted my students to apply reading from the textbook to a video of a Guided Reading Lesson. I then wanted them to evaluate the input of their peers, and use the commenting feature to support a threaded discussion. I structured the activity in Google Slides and shared it with my class. Students were directed to form groups. In class students divided up the tasks in the assignment according to each group’s needs. Outside of class, students completed their tasks and commented on the work of their group members. To view the shell. To view a completed group slide presentation. When designing instruction through Google Slides you create an instructional resource that students can preview and review. Presentations can be shared with students prior to class with directions to watch a video, read an article, or respond to a question. If students are absent, they can still access course content. Students can access lessons as many times as needed to interact with content. Instructors can design learning experiences that allow students to work at their own pace while still collaborating with peers. These lessons or modules can be completed by students in class, freeing the instructor to provide individualized instruction, or can be completed by students outside of class asynchronously. I had to miss a class due to illness, so I replaced the face to face session with an online module in Google Slides. Time and location are no longer a barrier to instruction. To see this module. These are just a few of the benefits I have observed so far. If you are interested in learning more about Google Slides, there will be a series of Google Apps for Education Workshops in FIT Studio during the Spring Semester. Hope to see you there.